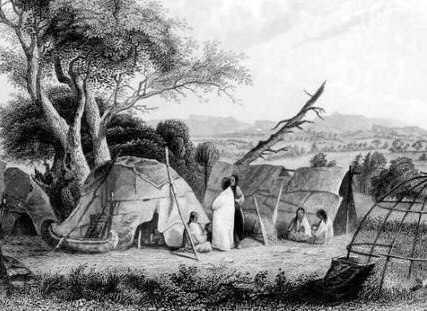 What was a Wigwam? 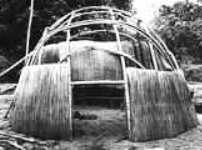 The Wigwam was a typical birch bark structure used as a shelter or house style that was built by many tribes of the Northeast woodland cultural group who made them their homes. 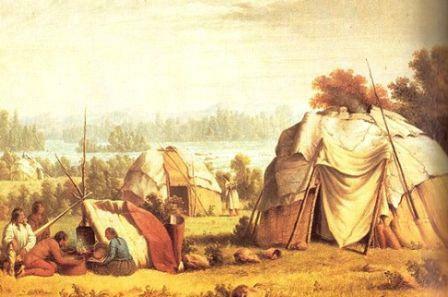 Learn about the structure and the interior of the Wigwam with pictures and images with facts and information about the tribes who used them, including the Abenaki, Sauk, Fox, Ojibwe (Chippewa) and Wampanoag. The picture is of a Chippewa (Ojibwe) village at Sault Ste. Marie on the St. Marys River in Ontario, Canada in 1846.